It remains to be seen if the Louis Vuitton iPad case is made well or not. You would think that a designer handbag company would make sure to craft an iPad case that is at least made well. But you’d be surprised to find out that even top designers like Chanel, Vuitton, Hermes, and others sometimes outsource the manufacturing of their overpriced luxury items to the lowest bidder. Sure, the case was designed by some artsy guy named François in Paris, but it wasn’t necessarily hand-crafted by French fashion artisans. 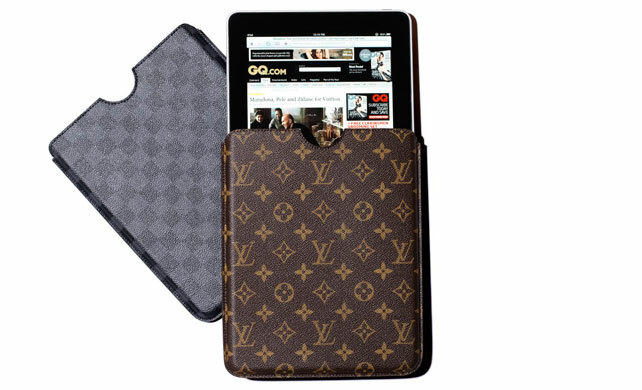 Because of this, the average iPad user simply won’t invest in a Louis Vuitton iPad case. They’ll opt for an iPad case from Uniea, Belkin, Griffin, Case-mate, or otherwise that can actually protect an iPad. So, if only the label-conscious iPad user will buy a designer iPad case, this question remains: does the iPad itself qualify as a status symbol? There is no doubt that the hordes of Apple followers (like me) are cultishly devoted to the Apple brand. But the “Apple Movement” is an unusual one in that it isn’t centered around being seen with the bitten Apple logo. Rather, the Apple devotées are drawn to how their gadgets can enhance their lifestyle and communication with friends and family. To be sure, Apple does its darndest to burn their logo into all of our retinas. After all, the Apple logo is illuminated on the backs of its laptops. And yet, Apple enthusiasts are perfectly comfortable with covering up their glowing Apple logos with cases that keep their gadgets secure and protected. In this way, most Apple users do the opposite of what label junkies do: they cover up the logo in the name of ensuring the safety of their product. By extension, this proves the fact that an iPad case like the one from Louis Vuitton is designed to status-ize an otherwise non-status iPad. Depending on whether you buy the Vuitton iPad case, at least now you know where you stand on the issue.